imgAreaSelect is a jQuery plugin for selecting a rectangular area of an image. 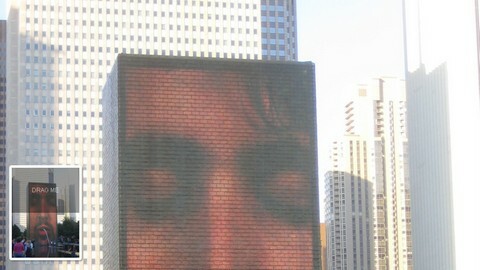 It allows web developers to easily implement image cropping functionality, as well as other user interface features, such as photo notes like those on Flickr. imgAreaSelect is highly configurable and customizable with CSS styling. Keyboard support for moving and resizing the selection. It works in all major browsers, including Firefox 2+, Opera 9.5+, Google Chrome, Safari 3+, and Internet Explorer 6+. 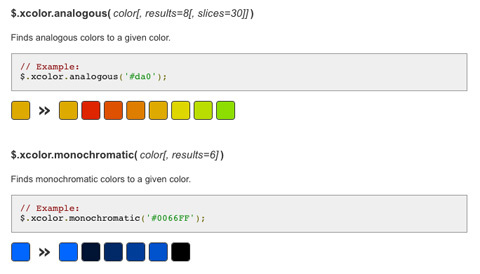 The xcolor plugin is an easy-to-use jQuery extension to manipulate colors in all imaginable combinations. 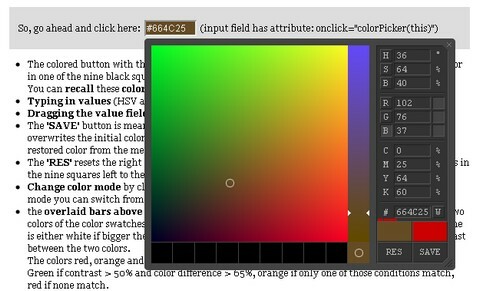 This plugin implements an extensiv color parser and a featureful set of color-manipulation methods. There is also an animate() extension to smooth CSS colors. Another useful method isReadable() completes the whole, by allowing you to check if a text is readable on a certain background. The color value can also be passed in different color models: RGB, HSV/HSB, HSL and their adequate alpha extensions. jQuery Image Scroller Plugin creates a scrollable interface to scroll over a large image in a smaller area. The idea is that we have a container with a fixed height and width, an image that is taller than the container, and a container for the thumbnail of that image. Once the plugin is applied, there is a span with a class of indicator appended to the small preview area which represents the area you can drag up and down. After more than two years in iterative development, you get the best of the best practices baked in: cross-browser normalization, performance optimizations, even optional features like cross-domain ajax and flash. A starter apache .htaccess config file hooks you the eff up with caching rules and preps your site to serve HTML5 video, use @font-face, and get your gzip zipple on. CLEditor is an open source jQuery plugin which provides a lightweight, full featured, cross browser, extensible, WYSIWYG HTML editor which can be easily added into any web site. In addition to the standard text formatting features found in other WYSIWYG editors, CLEditor also contains rich drop downs for font name, size, style, text color and highlight color. CLEditor allows you to insert images, hyperlinks and horizontal rules. CLEditor supports the following browsers on both the mac and pc: IE 6.0+, FF 1.5+, Safari 4+, Chrome 5+ and Opera 10+. All testing is done using jQuery 1.4.2. This highly customizable and easy to install app comes in 4 different sizes (from 151 x 87 pixels to 405 x 302 pixels) and therefore different feature levels so you can use it for every supposable cause from ‘easy choice’ to ‘professional determination’. That’s probably all you’ll ever need to let your clients choose the right color. You’ll also find a lot of extra helpers and smart features like contrast-meter, color-difference-meter, value-slider in input fields, web-smart and web-save button, color memories and much more that can help your clients make the right decision. Broken links and 404 Errors are a problem that have plagued almost all websites since the dawn of the internet. There’s nothing attractive about clicking a link hoping that it’ll take you to your destination only to find out that the page doesn’t exist. 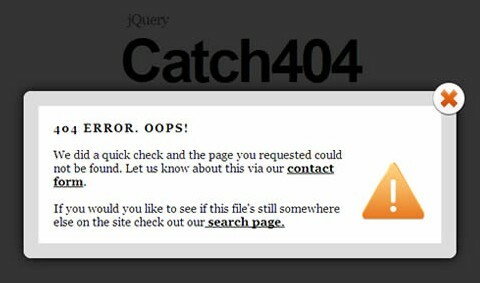 Addy Osmani has written a new jQuery Plugin called Catch404. Through the magic of jQuery we are going to catch 404 errors without your users even having to leave the page and then suggest some other options they have got using an inline jQuery Modal window. The benefit of Catch404 is that you can offer your users a better experience when errors are encountered on your site. 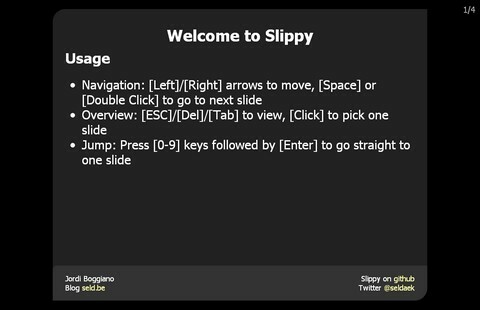 Slippy is a HTML Presentation library written with jQuery, it takes a html file in and plays it in any browser. It is optimal for programming-related talks since it includes a syntax highlighter and is very easy to use since it’s just standard html markup with a few classes to enable specific functions. Sencha Touch allows your web apps to look and feel like native apps. Beautiful user interface components and rich data management, all powered by the latest HTML5 and CSS3 web standards and ready for Android and Apple iOS devices. Keep them web-based or wrap them for distribution on mobile app stores. You can easily shift theme coloring, add style, and use our pre-included icons to deliver a phenomenal visual experience. Animate between views using one of our many predefined animations, with loads of configuration options. TomatoCart is the new generation of open source shopping cart solution. It is branched from osCommerce 3 as a separate project. As web applications become more and more sophisticated, modern web 2.0 technology such as Ajax and Rich Internet Applications offers significant usability improvements and makes interacting with the web interfaces faster and more efficient. They have compared a lot of frameworks and come to the conclusion that ExtJS is the best framework for TomatoCart. They completely rewrite osCommerce 3 administration site based on the qWikiOffice project which is a web desktop implementation of the ExtJS RIA framework. Web desktop application mimics user experience of desktop Operating System, offering features and applications similar to a PC environment. 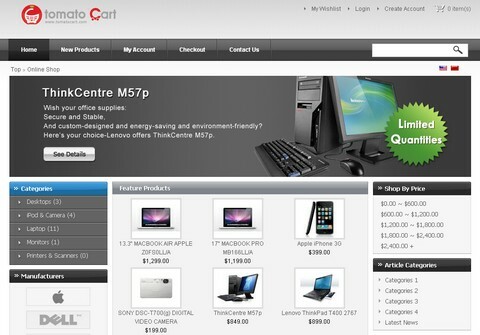 So that users can easily start to work with TomatoCart without any difficulty. One of the core features of TomatoCart is that it allows users to keep several windows open simultaneously, to enable users to work with several modules such as products, customers and orders at the same time.